I'm an award-winning online writer and journalist. I still remember the first time I went shopping in Manchester. It was raining (of course) but beneath the rain the city glistened and all around me, people were darting to and fro as if the bad weather just added a dash of extra spice to their shopping trips. 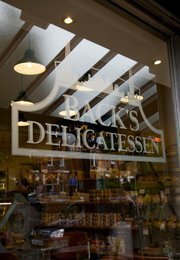 1)	Back's Deli: If you're looking to try some mouth-watering local specialities, head to Back's in Heaton Moor, Stockport. Here you'll find that famous classic: Lancashire hotpot, as well as more far-flung delicacies like Taboule and New York Potato Salad. A great place to head for a spot of lunch. 2)	Piccadilly Records: No mention of Manchester's independent shopping scene would be complete without paying homage to this music-lovers' retreat on Oldham Street. You can spend many happy hours flicking through CDs and vinyl of almost every genre. And, if you can't remember exactly what you're looking for, the staff are usually pretty happy to play Name That Tune. 3)	Manchester Craft and Design Centre: Located in the old Smithfield Victorian Fish Market, this beautiful building with its stunning glass roof houses a range of unique pieces and a tasty coffee shop. 4)	Retro Rehab: A vintage boutique housing a glorious dolly mixture of wardrobe gems from times past – a lovely place if, like me, you delight in flowing fabrics and bold colours. 5)	The Emporium: A bit further flung, this interiors and gift haven is in Clitheroe, Lancashire, rather than downtown Manchester, but I urge you to visit. This former Methodist Chapel houses floor after floor of beauteous furnishings, plus a wine bar and brasserie.